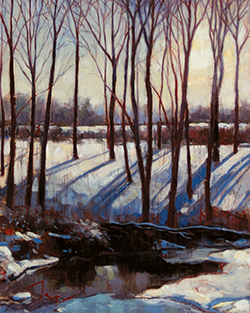 George Thompson is a nationally recognized, award-winning fine artist known for his landscape, portrait and figure painting in a contemporary, traditional style. He received his Bachelor of Fine Arts Degree from Pratt Institute in New York and also studied painting and drawing at the Art Students League. His work has been exhibited at the Woodmere Museum in Philadelphia, The Art Students League, The Philadelphia Sketch Club and The Trenton State Museum in New Jersey where over 30 of his figure and portrait paintings and drawings were on view. Thompson's portraits have appeared twice on the cover of The Artist's Magazine. His paintings are part of prominent collections throughout the U.S. Thompson teaches painting and drawing at Delaware Valley University and runs workshops and classes at other venues throughout Bucks County, PA. Paintings available. Call or email the studio to make an appointment. Inquire about classes, workshops and private lessons.